Jay Overton is generally available Tuesday through Friday and Saturday mornings. Lesson scheduling begins at 9:00 AM and the last lesson is at 4:00 PM on Tuesday-Friday and 12:00 PM on Saturday. Scheduling of lessons should be at least one day in advance. Wire transfers, personal checks and cash are acceptable forms of payment. Jay Overton, a Life Member of the Professional Golfers Association, has competed in 24 major championships on the PGA and Champions Tours. 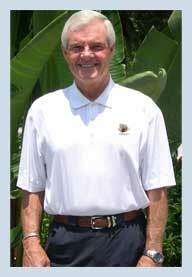 He has conducted hundreds of golf exhibitions and clinics and has been an inspiration to thousands of individual students. Without question, Jay Overton is one of the most recognized and sought after PGA Professional, teacher and player in the country.